I have used versions of this picture in many of my talks over the last 10 years, and it just keeps getting more interesting. The overarching message is that we are in the midst of a remarkable wave of innovation, with major advances coming to fruition across many different technology domains, at more or less the same time. This is creating fertile conditions for all manner of new products, services and experiences to emerge through what economist Hal Varian calls “combinatorial innovation” (a nicely refined phrase for an incredibly messy process). Another way to put it is, this is the ubiquitous computing + digital media + internet + physical world supercollider, and we are starting to see the results of a very big, long-running experiment. It has become somewhat of a cliche to promise radical transformation of businesses through technology, but just because it’s a cliche doesn’t mean it’s wrong. 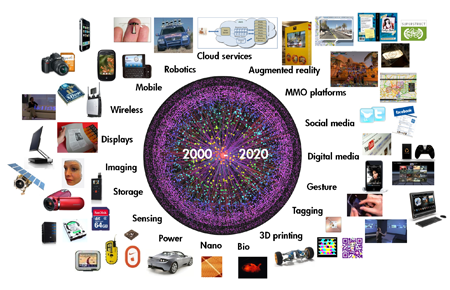 Over the next several years, much of the physical world will become connected into an Internet of people, places & things. This will fundamentally change the nature of our experiences with products, services, environments, organizations, and each other. There is no industry or institution that will be untouched; in retrospect we will see that traditional media companies were simply the low-hanging fruit. Just as the Nike+ running system transforms a shoe into a networked sensor node and an apparel company into the host of a worldwide social media community, combinatorial innovation will plant seeds of opportunity and disruption widely.